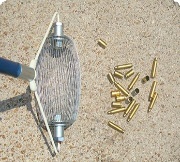 Easy-to-use Ammo Picker Uppers for your ammo clean up needs. Options for portability as well as spent ammo. Makes clean up fast and easy.